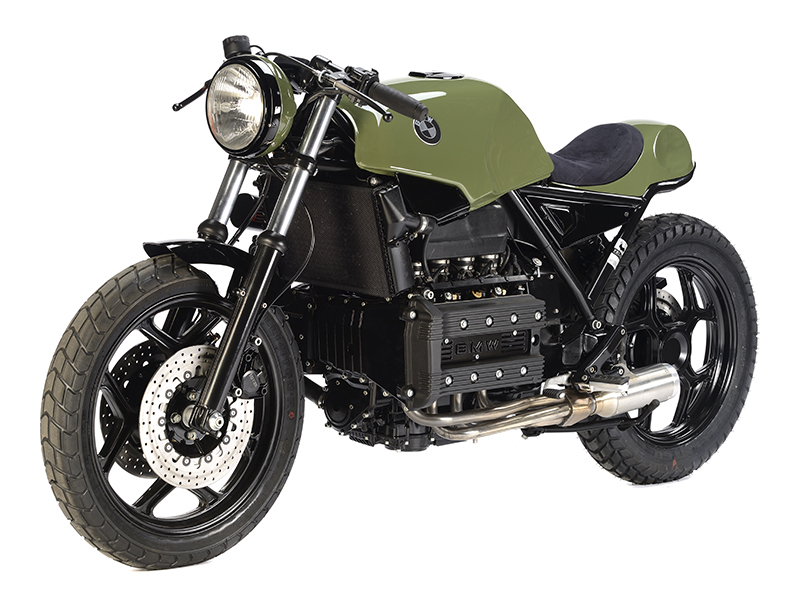 Considering the success of our first preparation based on BMW K100 - the Café Racer Félix sold the day after its launch on the website! - it was difficult for us not to redo a preparation by continuing to use the rear shell that we had specially developed. All the more tempting as we also had a good number of parts in stock. 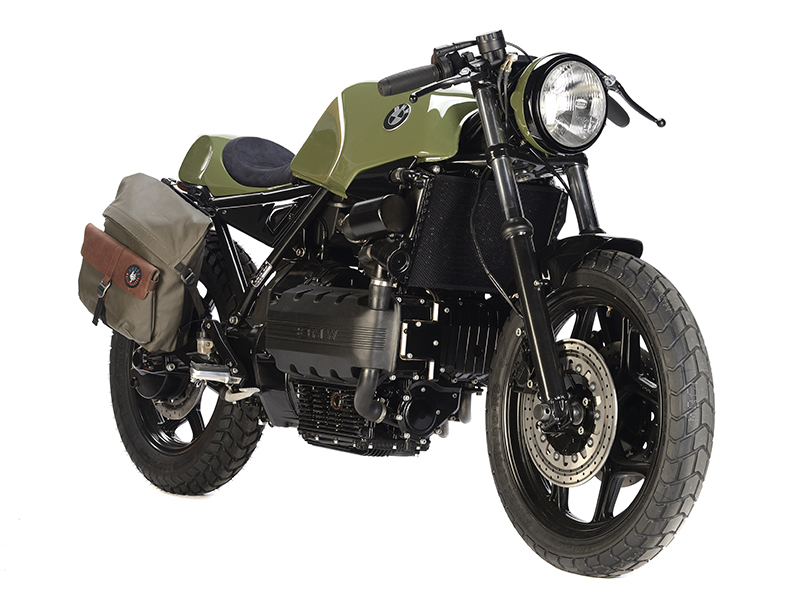 However, at Félix, the rule has always been and still is never to make the same bike again. 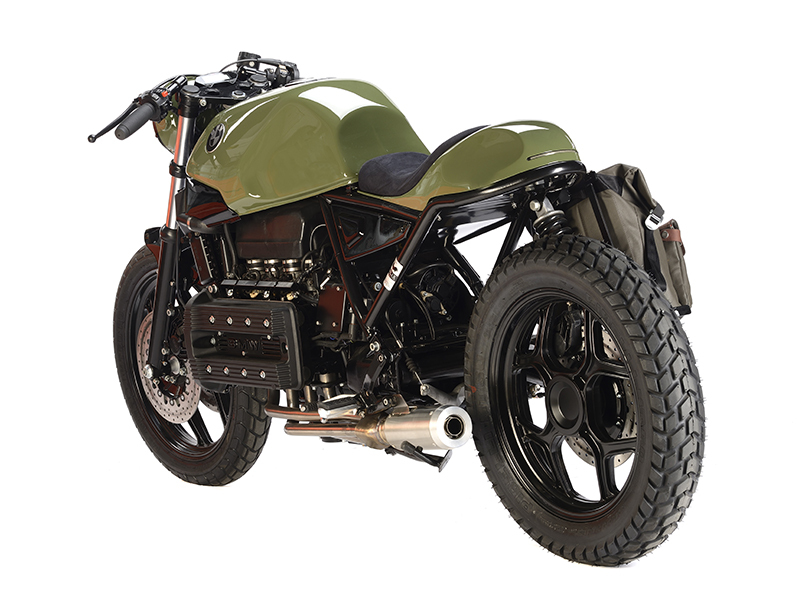 No way to reproduce a ‘sisterbike’ of this Café Racer in different shades or finishes. 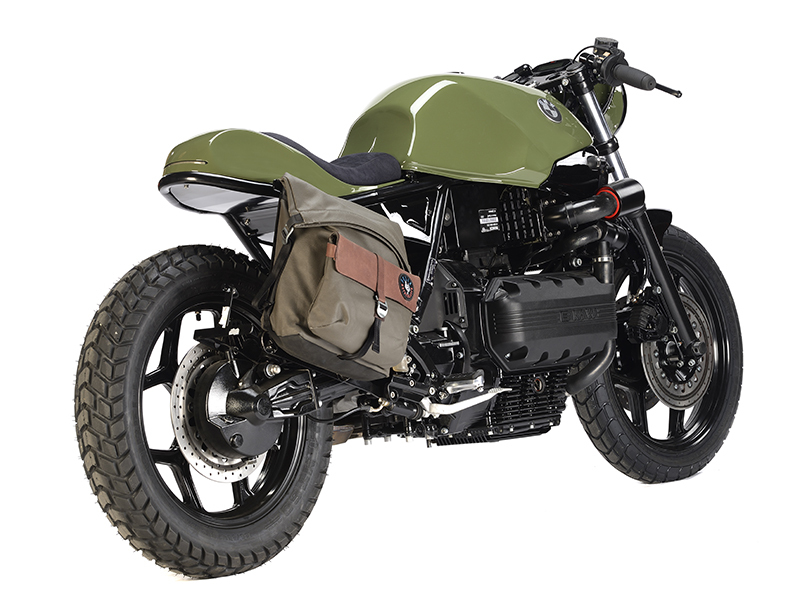 We had to find something new in real contrast to the first K100 which was blue/white/red in Felix colours. As he systematically does before each preparation or restoration, Patrick has completely dismantled the flat four cylinder to give it a life and ensure that this machine will swallow the kilometres for many years to come. He then began to modify the rear part of the frame to adapt our homemade seat support in fiberglass and the side covers under the seat. 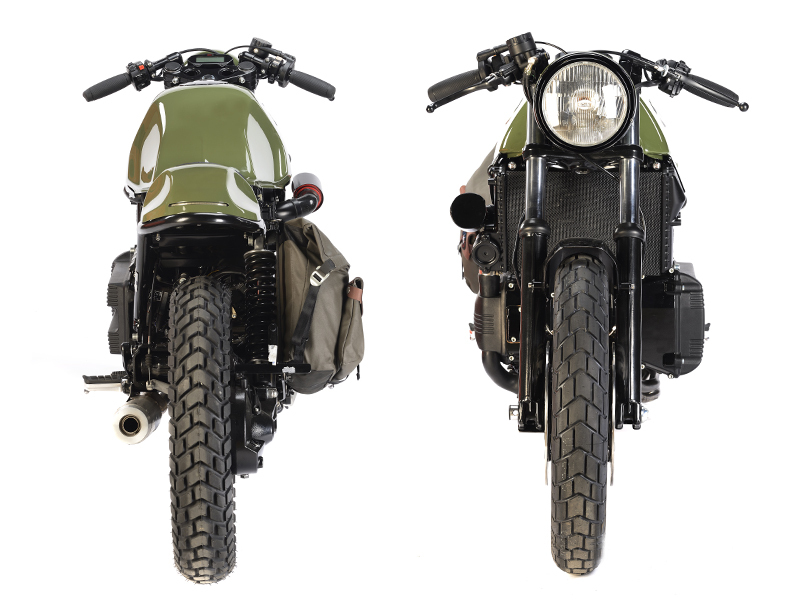 As on the K100 Café Racer, this rear shell integrates under the simplicity of a horizontal line a set of lights, brake lights and LED indicators. Then it is time to manufacture the aluminium tank side covers, then to fix the removable support of the Félix bag. The battery holder is moved, the Neiman migrates under the tank and the original air filter housing is removed to make way for a cone topped by a snorkel-style housing. We're still delirious! The original fork is lowered and reconditioned, as are the shock absorber and braking elements. Wristbands mounted with extensions optimize driving comfort. 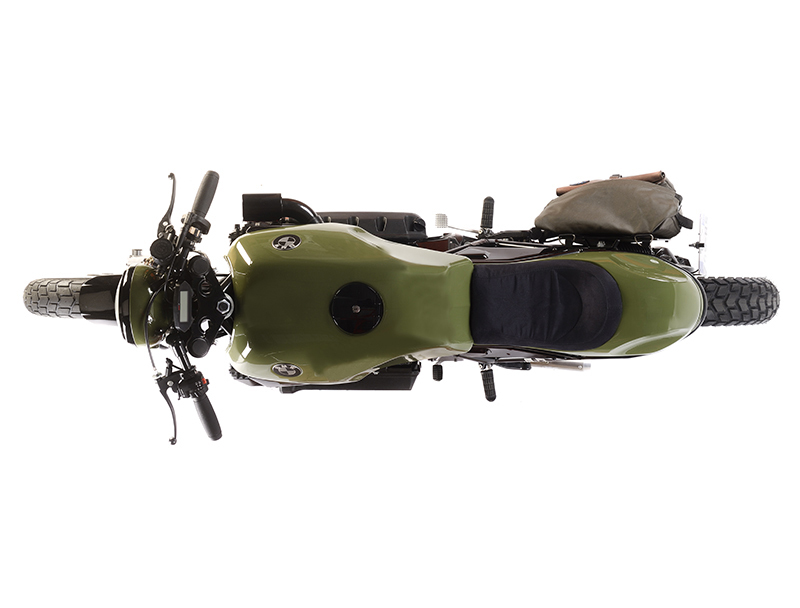 A Koso digital counter, micro turn signals under the tank and a new front fender based on the original complete the front of the machine. The usual Firestone De Luxe models are replaced by Pirelli MT 60 with a dual profile to perfect the off-road aspect of the beast. On the exhaust side, the adaptation of an absorption silencer requires the manufacture of a new manifold. Still a big painting job! 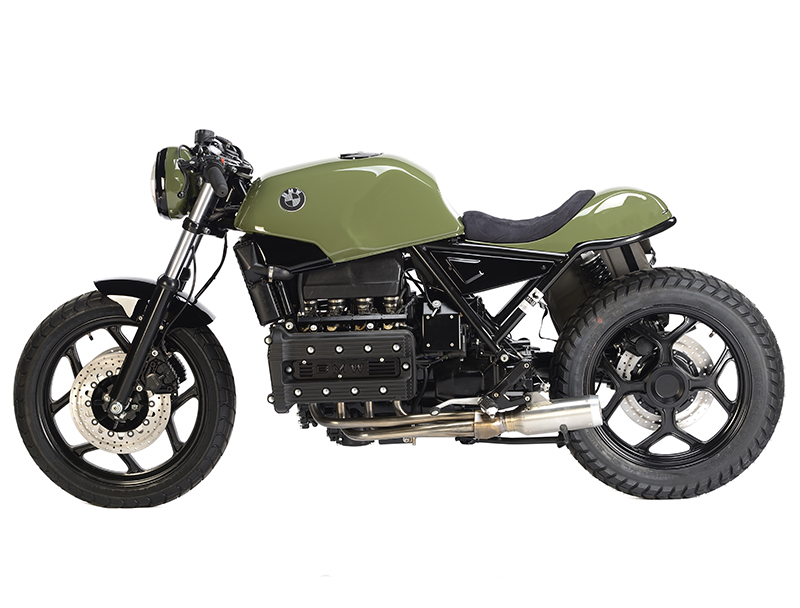 Engine, frame, single swingarm, fork bottom cases, brake calipers, side seat panels, rims, take the direction of our official partner 1PEC to receive a glossy black epoxy coating, while headlight, tank and rear shell turn to the famous green RAL 6003. Finally, the specific seat is made by our master saddler Vincent Bouffort and receives a black suede leather cover with diamond shape stitched on its upper part. 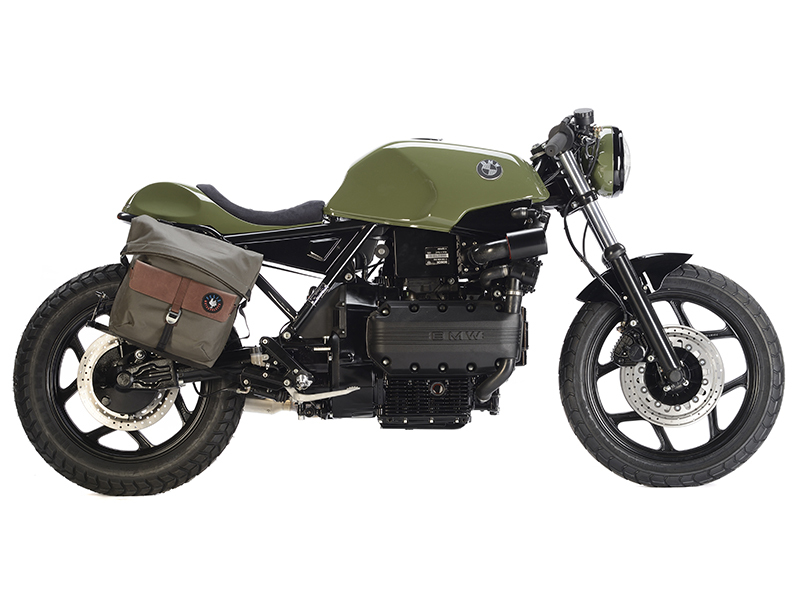 At the crossroads between Café Racer and a Scrambler, this second interpretation around the K100 requires only one thing: to ride beyond the enemy lines of monotony!